When you remove a ppa from Lucid it won't go away from Software-Center even after updating the apt cache. 1) Install a third party ppa. 3) Start Software Center, ppa will be enabled. 4) Remove third party ppa. 6) Start Software Center, ppa is still enabled. The equivalent for adding a PPA is bug 782953. In you step 4), when closing software sources, youshould have been asked to reload the repositories. Did you ? If not, USC can't know the PPA is gone. I have the same issue, except that Software Center is showing two repositories that I have not just disabled but completely removed. These repositories appear no longer neither in the Software Sources list, nor in Synaptic’s origin list, nor in /etc/apt/sources.list.d/. The two removed repositories are ‘PPA for Telepathy’ (ppa:telepathy/ppa) and ‘yorba’ (ppa:yorba/ppa). same issue here, disabled 3rd party repos in software-sources gui, then removed 3rd party sources in software-sources gui, then removed from /etc/apt/sources.list.d/ at CLI, had been refreshing software sources every time i made a change... no luck, old ppa's still showing up in Software Center... tried completely removing and purging Software Center, on reinstall, old sources are still present. figured i'd follow up on this... not sure what changed, but after a few reboots, the software-center is no longer showing the removed ppa's. Old repositories have finally disappeared for me as well, but only once I removed this package: app-install-data-medibuntu. That package is a recommended part of adding the Medibuntu repository, according to https://help.ubuntu.com/community/Medibuntu#Adding%20the%20Repository . Removing it seems to have made no noticeable difference other than fixing this bug. I’m not sure if the bug is caused by the package or merely exposed by it. Nathan, did you remove that package as well? Anyway, I hope this helps track down the issue. nope, i didn't remove that package, they just randomly disappeared. sorry to take so long to update this, but once it quit being a problem, priority understandably dropped. The software center keeps the ppa because you still use the ppa version. Can someone confirm that this is not an issue thanks to Glennz nl's findings? >Can someone confirm that this is not an issue thanks to Glennz nl's findings? NACK. I've got an entry for a GStreamer-related PPA that I purged out a long time ago (in all ways I can think of) but that won't go away from software-center. Furthermore, I've got other PPAs that *do* dissappear from software-center as soon as they are disabled, even if residual packages remain from them. Currently investigating to figure out what the heck is up. seems to have made the problem go away. Looks like this may have something to do with software-center's xapian cache under /var/cache/software-center/. BTW I did make a backup of /var/cache/software-center/ before running that command, in case that's useful for debugging. is it happening in Ubuntu 10.10 for anyone? Yes. I got this problem in Ubuntu 10.10 just now, and it was mitigated by Daniel Gnoutcheff's suggested command. However Daniel's workaround did fix the issue. I'm not sure how Software Center would know when PPAs have been removed or deactivated to automatically update it's cache. And obviously, having the user run a terminal command that they probably don't know exists is not a viable solution either. Other alternatives would be for us to connect to 'something' (not sure if it's possible) that would send Software Center a signal when a PPA has been removed or deactivated so update-software-center could then run without user action. I'm sure Software Center already detects when an external app has changed the packages but it doesn't seem to work in this particular situation? i think aaron's suggestion is a good one, possibly a hook into ppa-purge and software-properties-gtk to write a 'last-modified' file containing a timestamp that can be compared to a 'last-run-date' for update-software-center, triggering an automatic run of update-software-center by USC when the timestamps show it's needed... just throwing ideas at the wall, but the more transparent this is to users the better, your 'average joe' doesn't really want to think about software sources, my experience is that it's hard enough getting new users to realize that software can be installed from within an application as opposed to an internet download. All other things being equal, a solution that has zero user interface is better than one that has non-zero user interface. Could USC (or something else) watch /etc/apt/sources.list, and trigger update-software-center whenever it changes? That's probably possible, there may also be some other solutions that are beyond my knowledge. I'll have a chat to mvo and see if he has any better ideas on how to achieve this, but we can press forward under the assumption that if possible, we'd like to avoid any UI involvement at all. Is this bug fixed on natty? yes, USC 4.0.4 in natty appears to use software-properties-gtk for managing sources, so i would call this fixed. I'm having this issue with Oneiric. Tried the 'update-software-center' trick but didn't help at all. I was having this issue in Oneiric and discovered that some libraries in the deactivated PPA had been installed as dependencies for a package in another PPA. In my case, it was matthaeus123's GIMP PPA that wouldn't go away and Darktable from pmjdebruijn's PPA that had pulled in the dependencies from matthaeus123's PPA. 1) Click the arrow next to "All Software" and choose the rogue PPA from the drop down. 2) If there are any packages listed with a green check mark, uninstall them. Note that this may require that Software Center remove software from another PPA be uninstalled. 3) Exit Software Center and reboot. 4) Re-install software from other PPAs that was removed in step 2. After I rebooted, the rogue PPA was finally gone. It may be possible to avoid step 3 by using update-software-center. This is broken for me in 12.10, and none of the suggested workarounds helped. I removed the PPAs throught the GUI, and double-checked that they were gone from /etc/apt/sources.list and /etc/apt/sources.list.d. I also tried removing the cache in /var/cache/software-center/ and running "update-software-center". I also ensured that I had no packages installed from the problematic PPAs (I didn't). 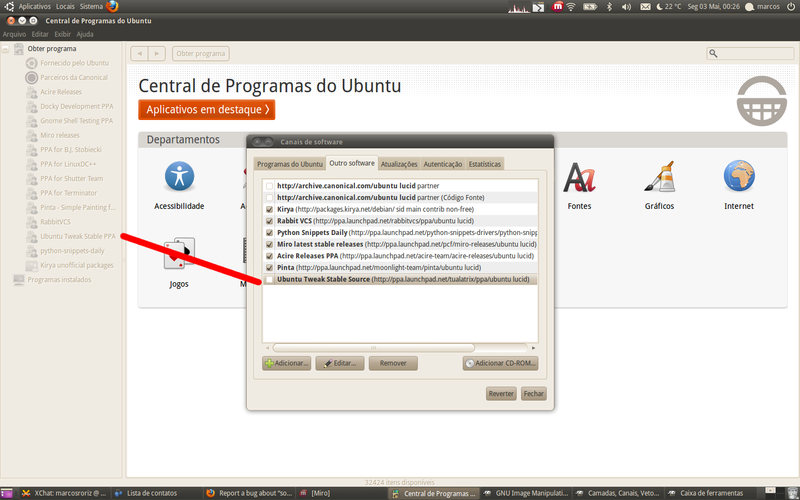 Still no luck, the PPA items remain in Ubuntu Software Center under the "All Software" and "Installed" dropdown menus. Did you try the "sudo update-apt-xapian-index" command? off-topic: Where can I find out more about the different software center-related commands for future problems? Unfortunately i neither know update-software-center existed before today. What I know is that apt-get update updates dpkg & co database, while xapian etc etc updates the software-center one. I think that about version 10.10 and 11.04 update-software-center has been replaced with update-apt-xapian-index.